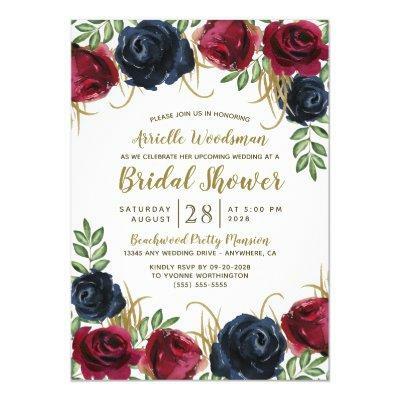 Navy Blue Burgundy Fall Bridal Shower Invitations - features elegant watercolor roses and peonies in various shades of Marsala, burgundy, merlot and navy blue with elegant greenery. There are touches of sprigs of gold throughout the flowers and greenery. The font layout displays printed gold and bronze ink colors for added decor. View the matching collection on this page to view all matching products.